The last time I shared a progress picture, the afghan I was working on was 12 x 11 squares. The colors were blending nicely, but it wasn’t very big. 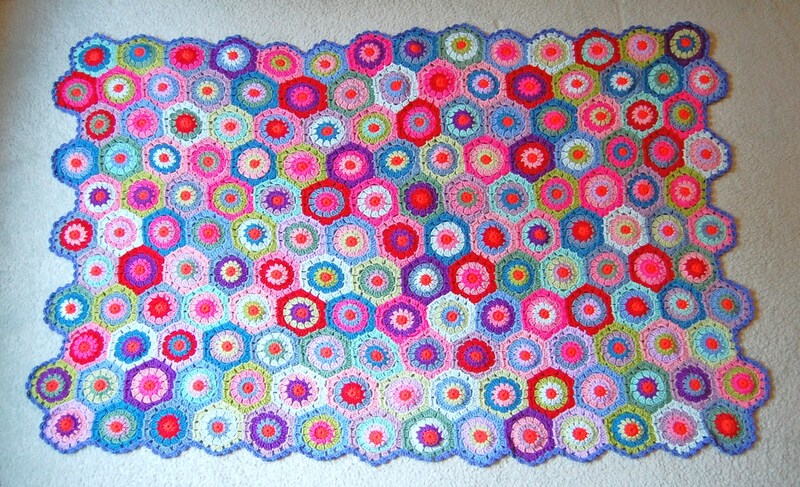 If you’re going to hand-crochet a blanket, then you commit to make a blanket. I decided to extend the pattern and the afghan turned out to be 12 x 14 squares. I worked until the yarn ran out. Now we’ve got ourselves a blanket! I added 8 rows of a granny-square border, working the same three double crochet cluster into each opening to mirror the look of a granny square. The inspiration was, of course, Attic 24’s Granny Patchwork afghan. Lucy of Attic 24 uses a different method for making granny squares and it’s one I’ve adopted myself. (Once you make 168 squares, you learn to love something). Lucy prefers to not work the chain between 3 DC clusters and only uses 1 chain instead of 2 for the corner stitches. Cutting out or reducing the number of chains makes a tighter square without sacrificing the base elements of the traditional crocheted granny. I really liked her modification. This afghan was the fourth and final piece in a series of blankets I’ve been working on for the last 4-5 years. I told myself I wouldn’t get sentimental, but it’s hard not to! 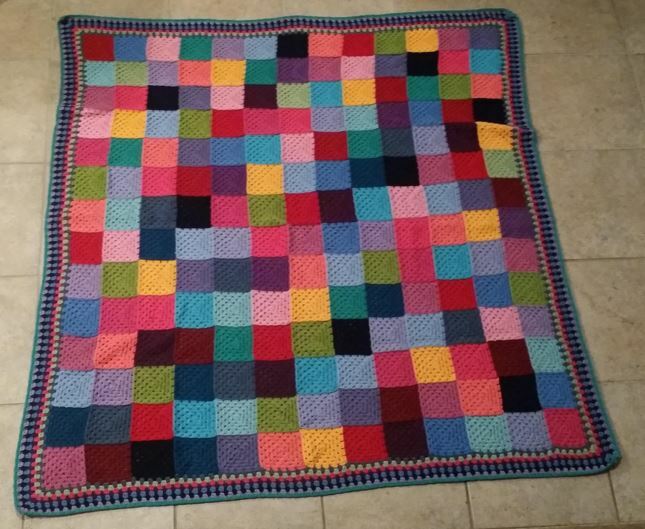 When I was a senior in college (2011), someone contacted me through my Etsy shop and asked me to crochet a blanket for her daughter as she started college. The plan was one afghan a year for four years. Of the four, my favorite was the third one–the Picot granny square. It also took the longest amount of time (by far), but the design is so unique I loved making it. Textured, small and large squares and the colors–just perfection. Over the years, the woman who contracted the blankets and I became friends. We exchanged Christmas gifts and emails, thoughts on the blankets as they came together. A random note to share vacation plans and life updates. She’s seen me move four times, congratulate me on two new jobs and always been a part of my free time. It was odd packing up the last of the blankets and writing the final note a few weeks ago. I’ve never met this woman or her daughter who graduated from Yale, yet somehow we’ve been part of each other’s lives. Her daughter joked she’ll have to consider grad school to keep the blankets coming! It’s the end of a JJCrochet era. Now the question becomes… what to work on next. 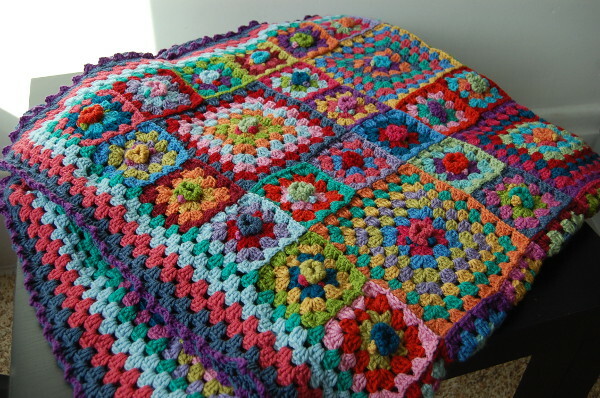 If you’ve been keeping tabs, I finished the third of my afghans–the crochet granny square flower–last spring. Since then, I’ve been busy working on the fourth and final installment of the afghans. It’s with great pride I present the Solid Squared Afghan! This guy differs from its three sibling since its squares are solid colors, not comprised of four to six different colors. The squares themselves are working up quicker (no time joining colors) and can I just tell you how infinitely excited I am to have 75% LESS ends to weave in. My fellow crocheters, can I get an ‘amen’?! This afghan was designed to be 12 x 12 squares, yet I found it too small. 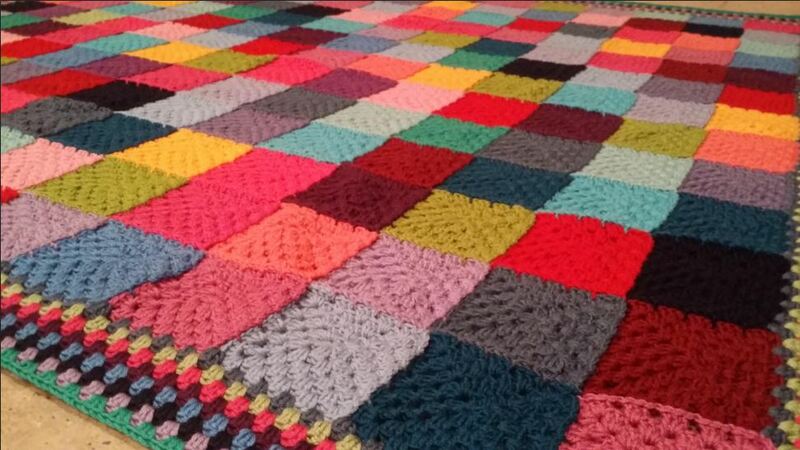 Each square measures just under four inches, forming an afghan 48 by 48 inches. I figured why stop there? I had enough yarn and plan to keep working until it runs out. This is also a great project to use up yarn scraps. Pick complimenting threads or random colors and join, join, join until you have yourself an afghan. It becomes almost mindless work–great while watching episodes of Arrested Develpment or Mad Men or nothing. 🙂 Enjoy!